Just as in the early days of mobile, when fortunes were made with mobile apps on the app store, it is now the perfect time to catch the opportunities offered by voice apps, so-called Skills. Often, the Alexa architecture is compared to the mobile architectures of iOS or Android. Sure, they also use the framework pattern, with apps serving as plugins. However, Alexa is entirely in the cloud, and the devices are just sensors and actuators that send and receive everything from the cloud. In a mobile architecture, the devices perform the computation, there is a mobile operating system running on the device, apps that are downloaded onto the device and also run on the device. When compared to a mobile architecture, there is considerably less platform code and app code running on the devices, and basically, all platform code and app code is in the cloud. When a Skill is installed, it never gets downloaded to the Alexa device. Installing a Skill is merely a configuration change on the Alexa service. No app actually needs to be downloaded and installed on an Alexa device. The Alexa service just links the user, device, and the installed Skills. 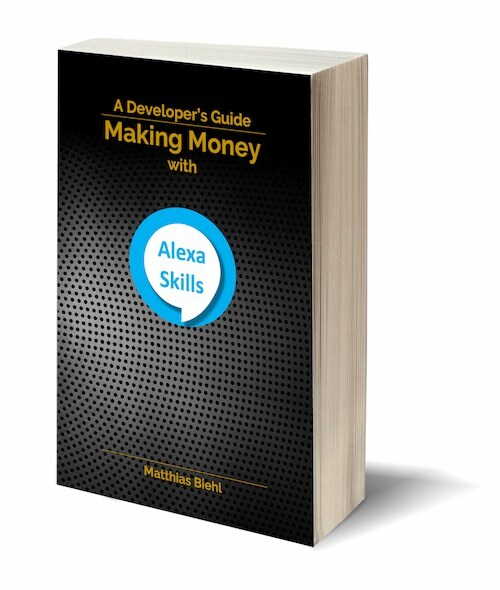 In my new book “Making Money with Alexa Skills – A Developer’s Guide” I describe not only how to develop Alexa Skills and add monetization features, but also show how to market newly developed Alexa Skills on the Alexa Store.